Heat a medium frying pan and fry the onion in the oil until soft – add the garlic for a further couple of minutes. Once your beetroots have cooked, leave to cook slightly and then peel and grate into a large bowl. Tip the bean mix into the bowl with the remaining burger mixture and give it a good mix up until well combined. Shape the mixture into 6 burgers and set aside. Heat a frying pan with a splash of oil and fry the burgers for 3 minutes on each side. 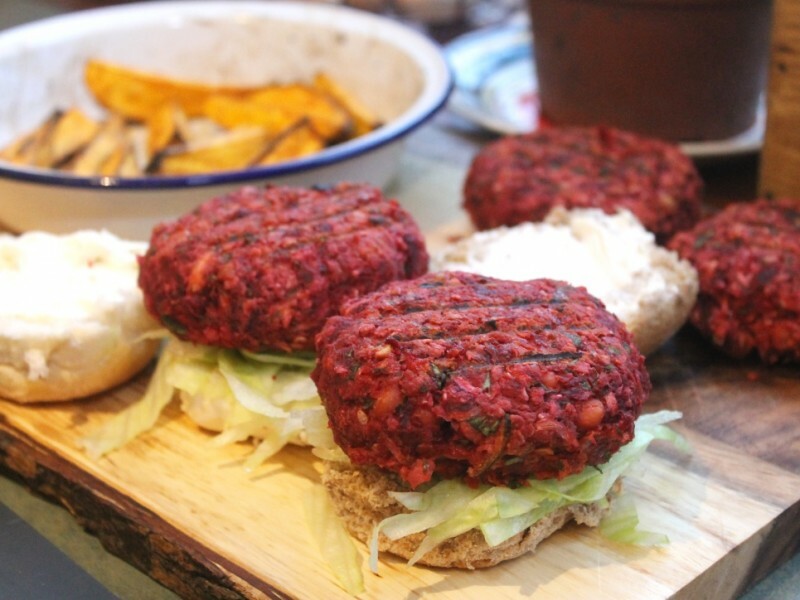 Assemble your burgers in the buns with some salad and top with a good dollop of houmous or ketchup. You could even add some sweet potato wedges to the mix if you fancied. I made these this weekend and they were delicious, will definitely be a new regular in our house! absolutely heavenly tasty. keep sharing more & plz follow mt blog too. Thanks all.